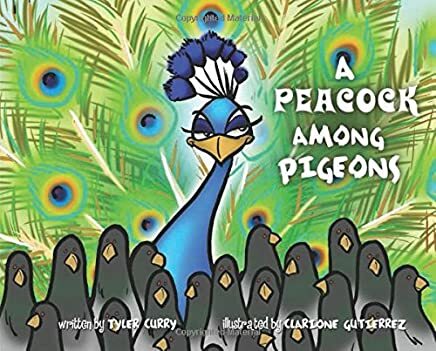 A Peacock Among Pigeons (2015), written by Tyler Curry and illustrated by Clarione Gutierrez, is about a peacock named Peter who is born into a kit of pigeons. He looks and acts different than the pigeons, so he just doesn’t fit in. The pigeons think everything about him is wrong! Words like “flashy” and “flamboyant” are used to code his difference, subtly queering him. He eventually flies away and creates a chosen family with an eclectic group of birds including a “sassy” cardinal named Craig. Peter eventually sees himself through knew eyes and is proud to be a peacock. A Peacock Among Pigeons is an acceptable, although by no means exceptional book. The message of self-acceptance is likely to resonate with many gatekeepers who may not even pick-up on the subtle queer undertones.